Well, I haven't blogged in a while, or actually not much at all because I keep fighting with myself over what should be included and what shouldn't be included...I decided what the heck...I might as well just start blogging and whatever comes comes...so there will probably be a good mix of a little bit of everything that makes it up here... maybe, unless the other side wins...who knows what will happen! Well I was reading one of the many design magazines I get every month when I came across this page and thought "Hey, I could use some tips to tidy up the laundry room!" so I started reading. I got half-way through the tips and laughed out loud (well not really because I was on the train riding home from work) but I might have snickered a little. 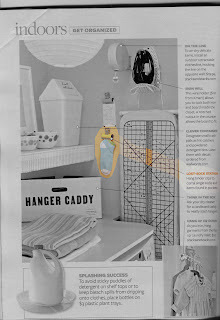 Anyway, the scan of the page isn't the best but here is what the tip says: "Lost-Sock Station: Hang binder clips to corral single socks and items found in pockets." Then I looked at the image... In my home, the "Lost-Sock Station" would have to have it's own room. And all the walls would have to be covered with binder clips...yet they show one clip with one sock! When has anyone ever lost only ONE sock? (and an impeccably clean one at that!) My dryer eats more socks than I do chocolate (and that's a lot)!